Nurses known as “Blue Birds” massaging joints at Base Hospital 43 in Blois, France. Credit: Courtesy Woodruff Health Sciences Center Library Historical Collection, Emory University. The stories of Emory doctors, nurses, and enlisted men who comprised Base Hospital 43 during World War I and World War II is the focus of "When the Emory Unit Went to War," an exhibition that opens Monday, April 28 at Emory University's Woodruff Health Sciences Center (WHSC) Library. An opening event, free and open to the public, will take place Friday, June 13, from 6-8 p.m. in the health sciences library. The exhibition, which is on display through March 30, 2015, features materials drawn from WHSC Library's historical collections and items from the university's Manuscript, Archives, and Rare Book Library (MARBL), including diary entries, scrapbooks, photographs, uniforms, and books about the unit. "The exhibit is a way to let students and the larger community know about this unique part of Emory's history," says its curator, Clayton McGahee, a WHSC Library archives specialist. Influenza convalescents in Ward No. 16, Annex 29 of Base Hospital 43. Credit: Courtesy Woodruff Health Sciences Center Library Historical Collection, Emory University. In 1917, U.S. Army Surgeon General William Gorgas called for the recruitment of medical personnel during World War I, just after the United States entered the war. The local group of 24 officers, 65 nurses, and 154 enlisted personnel trained for several months before being deployed to Blois, France, in 1918. They were called the Emory Unit due to the large number of personnel who came from Emory University. During World War II, the unit was again called into service, this time serving in Algeria and France. 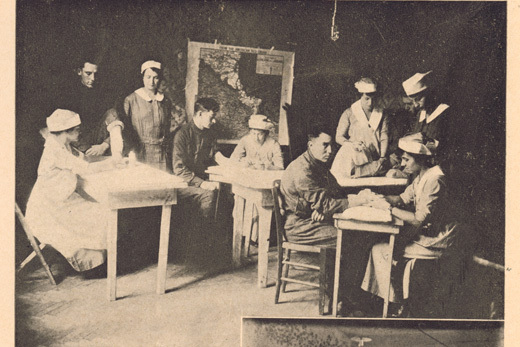 "Nurses and physicians sacrificed by enlisting, traveling to France and beyond to care for the wounded," says Sandra Franklin, director of WHSC Library. "In this exhibit, we have a glimpse of both medical and social environments through the eyes of the Emory Unit." One of the cases displays the complete nurse's uniform of Leila Anderson, who served in France during World War I. The case includes her original chambray dress, white apron, medical pins and worn, resoled shoes, along with a photograph of Anderson wearing the uniform. "To see something that was an everyday part of her life, and to see it here in such good condition, is a fascinating part of the exhibit," McGahee says. Among the photographs on display are images of the hospital exterior, wounded soldiers in the hospital wards, nurses in action during World War II, and nurses disembarking from a boat and wading into the water in southern France. Lt. Col. Edward C. Davis, founder of the World War I Emory Unit, and Maj. T. Sterling Claiborne of the World War II Emory Unit also are highlighted. The exhibition also features history books on World War I. In particular, "History of the Emory Unit: Base Hospital 43, U.S. Army, American Expeditionary Forces" provides detailed information about the life of Base Hospital 43, from its founding to the Emory Unit's return home from war. Other materials include a registered nurse certificate from Wesley Memorial Hospital and articles from both the Atlanta Constitution and Emory Alumnus. "The more you read about the experiences of Emory Unit members, the easier it is to be swept up by their stories," McGahee says. "The purpose for this exhibit is to bring everything together, to connect the Emory Unit to how it affected the university, and then take the time to tell the stories of select individuals." Franklin says that "When the Emory Unit Went to War" provides a second opportunity to showcase historical medical materials and artifacts acquired primarily through donations. "The first exhibition, 'Medical Treasures at Emory,' favorably promoted the existence of our historical collections," Franklin says, "We hope the community will be drawn to experience the story being told." The Woodruff Health Sciences Center Library is located at 1462 Clifton Rd. The library's webpage provides links to directions, parking, hours and maps.